Services will be held in the basement of town hall. A historic church that has been in Somers for hundreds of years was destroyed by fire on Sunday night and the Somers fire marshal, Robert Morpurgo, said investigators are still trying to rule out accidental causes of the fire, such as an electrical problem. They're also checking stories they've heard of kids being seen near the building, but at this point there's nothing to them, he said. At the church council meeting at town hall at 7 p.m. on Tuesday, moderator Anne Kirkpatrick says, members were to be told services will be held on Sunday in the basement of the town hall. "There's a feeling of wanting to be close to the church building right across the street," she said. During that meeting, the church council began delegating tasks to start moving forward. One of the concerns for church members is the food pantry, which was destroyed by the fire. Fire broke out at Somers Congregational Church on Main Street around 11 p.m. on Sunday and engulfed the building. There was nothing that firefighters could do to save the structure, Fire Chief Gary Schiessl said. 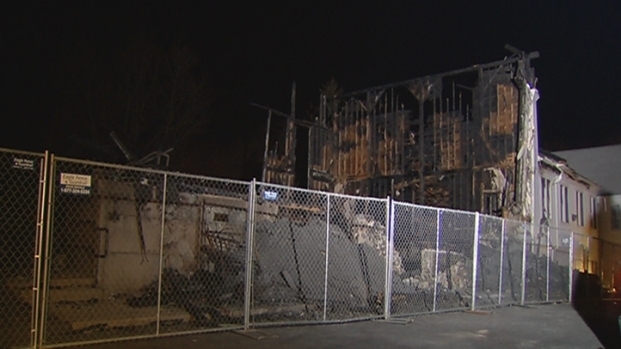 Two days after a devastating fire, a congregation in Somers is working to recover. "The fire was too intense by the time we got the first truck here," he said. The remains of the church bell lie outside the building. It would ring Sunday mornings to call the congregation. "It'll never ring again," Helen Austin, a church member, said. "But we'll replace it." The church community first gathered in 1727, according to its Website. The meeting house was built in 1840 and several buildings have been added on ever since. No one was hurt in the fire, but the heat was so intense that it melted the siding of town hall, which is located across the street. A daycare in the back of the church nearly caught on fire. “There was a large addition put on the back of it. We made a stop halfway back in that addition. That's where the fire stopped,” Schiessl said. Rev. Barry Cass, who has been with the church for 24 years, had tears in his eyes as he spoke about the fire and community members are devastated by the loss of the house of worship. A vigil was held on Monday at town hall. More than 300 people attended and medics had to care for one person who fainted. "People have been asking if there's anything they can do. Well now's the time!," he said on Tuesday. The church already has 13 or 14 committees that will be taking added responsibilities in rebuilding. "That's the thing about a Congregational church - the church is the congregation," he said. Since the fire, the church has received a $5,000 from a woman in Boston. Her name has not been released. Beth Rosa, of South Windsor, was married in the church and her children and grandson were christened there. “It'll be better than ever and there'll be a lot more generations to come - it's just the memories that you know that were in there, that's the sad part, that's the hard part for us, to know that you've lost the cross that was up there, the pew where you sat every week, all those really difficult things,” she said. A firewall behind the sanctuary prevented much damage to the church annex and the stained glass windows Rosa's mother made are still there. “It's beautiful to know it's there because it was something we all loved,” Joyce Conroy, of South Windsor, said. Investigators are now looking into this as a criminal matter. Police said they have several good leads but have not released additional information. Rachel Leonardo witnessed the fire. “I heard what was an explosion. All of a sudden, we saw big flames coming from the church,” she said.